This step enables you to set up advanced disc burner options. It is available only when backing up to a CD/DVD directly. Figure 11. Disc burner options. Disc title - use this field to define the label of your disc. 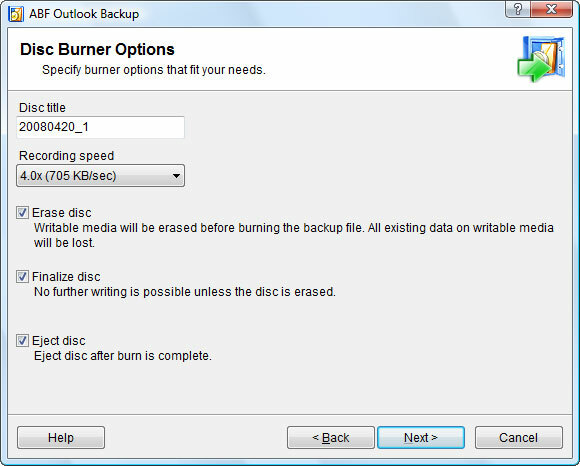 If backup file is burned into a several discs, the burner will automatically add a volume number to the end of disc title. Recording speed - use this option to choose writing speed for your disc. Erase disc - check this option to erase disc before burning. All existing data on the disc will be lost. Note that you can not erase recordable-only CD or DVD if it was already burned. Finalize disc - if enabled, the burner will finalize your disc after burn is completed. If finalized, re-writable disc should be erased for further writing. Further writing to recordable-only disc will not be possible. Eject disc - the burner will eject disc when burning process is completed.